I love Lois Lenski's cover as well, but this is the edition I have. Raise your hand if the Little House on the Prairie books hold a special, nostalgic place in your heart. You'll notice my hand is not raised. But the Betsy-Tacy books? Two hands high up in the air. The nostalgia kicks into high gear as soon as I see the covers. I well remember when my mom bought me the entire set when I was a teenager (although I don't remember why . . . I think it was for some other occasion besides my birthday or Christmas). You know I'm not much of a read-straight-through-the-series-kind-of-girl, but as a teenager, I flew through the later Betsy-Tacy books. I couldn't wait to see what would happen between Betsy and Joe. I have been eagerly anticipating sharing the early books with my boys and just hoping and praying they wouldn't be immediately prejudiced against a "girl" book. Luckily, they're still young enough to have a fairly open mind, and we enjoyed this first installment immensely. When the story begins, Betsy is a month away from her fifth birthday. (By coincidence, we started this book about a week before Aaron's fifth birthday, so it scored major bonus points right from the get go.) Her life revolves around her much beloved Little Hill (where she sometimes eats her dinner) and the elusive Big Hill (which she hopes to someday conquer). One evening, she meets the new little girl (Tacy) from across the street, and although their initial introduction is a little rough (Tacy is terribly shy), their friendship soon takes off. Life is so much better with a best friend. Pretty soon, they are engaged in all sorts of fun activities as well as helping each other through life's difficulties. This is set right around the turn of the century, and so there were many ideas my boys were completely unfamiliar with (horse-drawn buggies for transportation, the ice wagon, calling cards, etc. ), but it was nothing that couldn't easily be explained, and I it definitely added to the charm of the story. One of the things I loved was the way the story transitioned seamlessly in and out of Betsy and Tacy's imaginative play. Betsy would begin telling a story, and the next moment, they'd be in the story--flying in the clouds or drinking hot cocoa in the ice wagon. In these scenes, Aaron frequently had to ask, "Is this still pretending?" And I had to agree that it was difficult to tell where the pretending stopped and real life began again. But it was this very ambiguity that made it feel so real to me: this is the way real children think! They don't separate their play from life. Their play is life. Instead of being annoyingly confusing, I thought it showed an acute and accurate perception of childhood on the part of the author. There are two very poignant moments in the story. The first occurs when Tacy's baby sister, Bee, dies.At only five years old, Tacy doesn't quite understand what she is feeling. She is quiet and reflective and her little lip trembles involuntarily. Betsy is only five years old, too, but she somehow seems to know instinctively what Tacy needs. They climb a tree together and share ideas about Heaven; their minds fasten on one idea in particular--that maybe the birds take messages back and forth from earth to heaven. So they decided to send baby Bee a beautiful purple Easter egg via a bird. These two scenes complemented each other perfectly and really demonstrated the mark of true friendship: Betsy was there for Tacy; and then Tacy was there for Betsy. It reminded me of my freshman year at BYU. I had the good fortune of rooming with my best friend, Beth. The first semester, I was terribly homesick. It was awful: I couldn't eat, I cried all the time, and I thought of giving up and going home on more than one occasion. Beth was always there--a steady, reassuring presence. I was so grateful for her, but I couldn't figure out why she wasn't homesick, too. Then the next semester, my homesickness vanished completely, and all of a sudden, Beth was homesick--just as much as I had been. Then I got to be the shoulder to cry on. I've thought more than once how fortunate it was that if we were both going to be homesick, we chose different semesters for it. I think if you're going to place a theme on this book, as well as the entire series, it would be friendship. There are lots of fun, little examples (going calling in grown-up clothes, setting up a sand store, cutting out paper dolls), but the pinnacle moment for me was really seeing both Betsy and Tacy give a little of themselves in these moments when it really mattered, thereby strengthening and sealing their friendship. If I'm being completely honest, I probably liked this book better than Aaron and Maxwell. (They liked the next book we read, Henry Huggins, so much more.) But they still liked it and have even asked about when we're going to read the next one in the series. It's ready and waiting for us when we decide it's time. You're not alone- I haven't even read the "Little House" books yet as an adult. I'm not sure how this happened because I was constantly reading as a child and I remember that they were some of my friends favorites. I guess I just wasn't interested. Maybe I'll get to them someday. I've never read these, but I did love the "Little House" books. I can see why you wouldn't love them as an adult; they're very much geared toward children. 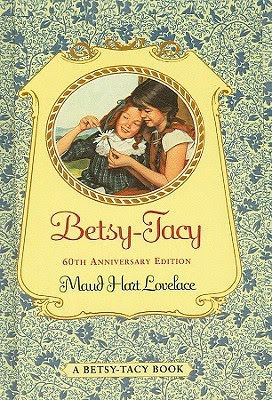 I am interested in these Betsy-Tacy books -- especially since the heroine is only five years old at the beginning! That seems like an anomaly among chapter books.